calico: merry pompom. kind of a tutorial. merry pompom. kind of a tutorial. I've been wanting a bright, inexpensive and unique wreath for our front door. And...I've been loving pompoms lately. So I combined the two. A pompom wreath. I like it. I'm not assuming that everyone will, because it looks a little like the carpet in our neighbors house across the cul-de-sac in like 1983, but the old shag feel is what I like about it. For those of you who can appreciate funky 80's shag, here's what I did. I used jewelry pliers to bend floral wire into the size of wreath I wanted. You could probably use an embroidery hoop, but I didn't want to spend money so I used what I had. I wrapped the wire in a couple layers to make it strong enough not to bend too much. 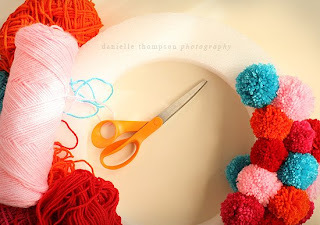 Then I made a ginormous amount of pompoms using my favorite new tool, the pompom maker. A great gift idea for a crafter. I tied each pompom onto the wire, using one end of each piece of yarn to tie it to the next pompom, so they'd stay tight in place. Easy. It took a day, with interruptions. These tags are easy, too. Just print your greeting on carstock and gluestick it to another fancy paper and cut it into a circle. I have a cool houndstooth print on the back of this one. Sew around the edge with your sewing machine using a bright color thread. Be sure to let the gluestick dry completely before you do this, or you'll have an uncooperative sewing machine. And a sticky needle. And an unmerry Christmas, because sticky needles stink. Put an eyelet (my other favorite crafty tool) in the top and tie a piece of yarn on. 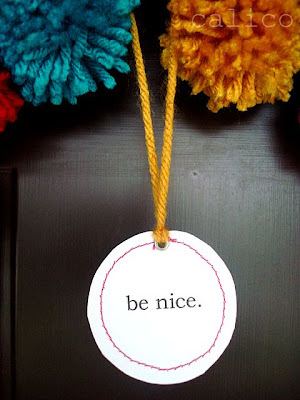 Use these for gift tags, or tree ornaments. 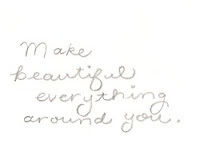 With trendy sayings like believe, joy, or cheesecake. You know, the kind of sentiments that encourage world peace. side note: After searching my new blog love, danielle thompson (mentioned in the post above) I found this. 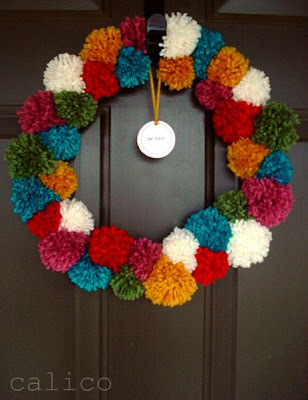 A pompom wreath. Fate? mmm hmm. We were meant to be. I like her colors a ton; I may have to make another. And trim them more. I love it. I love your PomPom wreath. Of course before I could mmake one I would need all of those snazy tools. 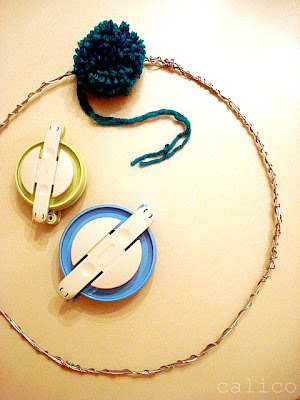 I love it but what the crap is a pom pom maker, and how do you use it? I need a tutorial on the tools! Lol. I bake not craft help! FUN - how about this---just put a different "hanging thing" in the middle and you can use it all year round. donna, you're crazy. You can't move to NY without having a solid understanding of the pompom maker. You buy it. You wrap yarn around it. Then you cut, and tie. There are instructions in the package. 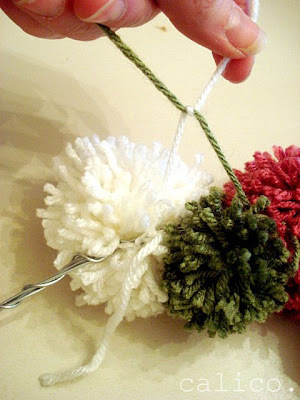 Don't try to make a pompom without a maker. PS. I love Christmas baking stuff. You know where I live. That is a very cute wreath. Definitely one I would like to hang on my door! Cally! so cute. you crafty girl. Love it! Perfect craft for grandchildren. this is my place to put stuff. Give yourself a place to put your stuff.